To fight android assassins, a young woman channels her father’s heroism—and faces a troubled past—in this “enjoyable, fast-moving, off-planet adventure” (SFSite). In the twenty-fifth century, under the leadership of the League of Peoples, war and crime are things of the past and life is held sacred. That is, as long as you are healthy and beautiful. But those who are deformed or flawed, or who appear to be misfits in any way, are destined—or is “doomed” a better word?—to become Explorers, crews assigned to probe worlds so hostile, the chances of returning are somewhere between slim and none. 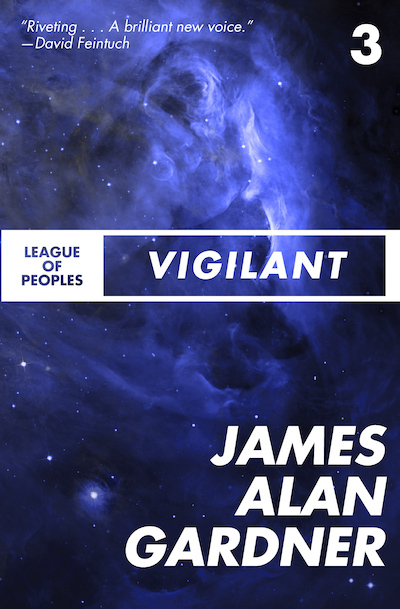 In Vigilant, the third volume of the League of Peoples series, a deadly plague has struck planet Demoth, wiping out millions of the winged Ooloms. Humans, however, were left completely untouched. But before the Oolom population was utterly devastated, Dr. Henry Smallwood found a cure. He lived as a hero for only a year before dying in a mining accident. Having grown up without a father, Dr. Smallwood’s daughter Faye attempts to escape her troubled past by joining the Vigil, a planetary organization that monitors the government. But on her first assignment, things go terribly awry and she and her team are targeted by android assassins. Uncovering a conspiracy that threatens the fate of Demoth, Faye turns to the only person she can trust—Festina Ramos.